← Orioles Win the 2011 World Series!! 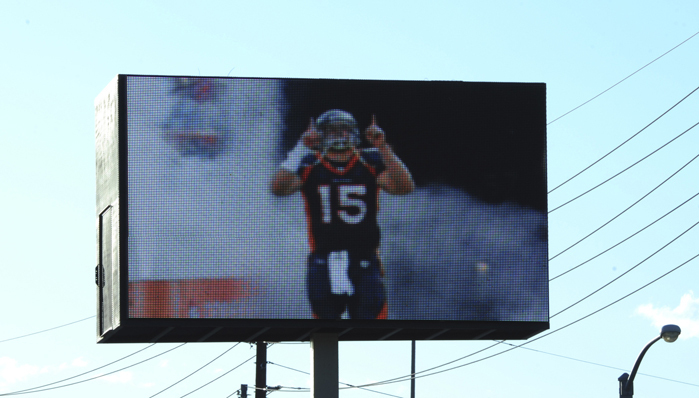 The Denver Post – An electronic billboard at E. 58th Avenue and Logan Street (across from the Denver Merchandise Mart) flashes an encouragement to Denver Broncos coach John Fox to play quarterback Tim Tebow. The sign was spotted Thursday evening, September 29, 2011. Pictures via Karl Gehring. Honestly, this digital billboard doesn’t even look real to me but I guess they were spotted today in Denver. Kinda bush looking. Apparently, this is not from the fans that said they were saving $10k to spend on a Tim Tebow billboard last month telling the Broncos how they should play him. Some company, Multiline, ran with the idea. Full story here. Shouldn’t be long before they hear from the NFL for copyright infringement, right? Either way, I think he’s a great person, and as a fan of Tim Tebow, and a fan of the Chargers, I really want this kid to play…it’s a win-win situation. He starts, good for him…. he starts, good for the Bolts. I think? 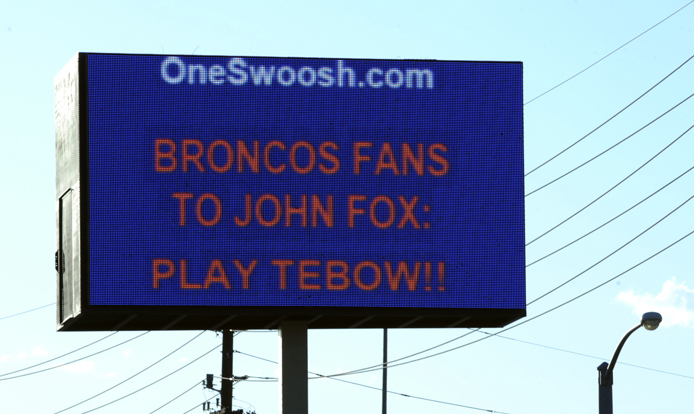 This entry was posted in Football, NFL and tagged broncos, broncos fans to john fox: play tebow, Chargers, denver, Denver Broncos, NFL, Tim Tebow, tim tebow billbaords, tim tebow billboard. Bookmark the permalink.